The brownies went over well today from what I gather. They were all gone in less than 2 hours. In general, most people preferred the cocoa style rather than the melted unsweetened chocolate. I just think the taste comes through better with the cocoa - i'ts more subtle. Dinner this evening was fun and pretty healthy! We had Gnocchi with Broccoli Fontina Sauce(CL). Rather than using a pre-made gnocchi, I made my own and just weighed out the amount called for in the recipe. 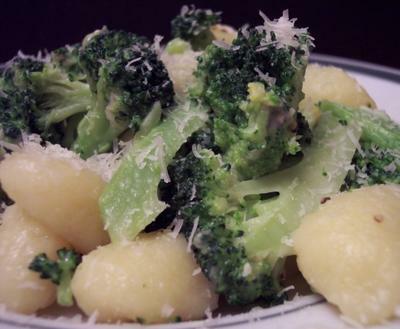 I also steamed the broccoli, rather than boiling with the Gnocchi, so we didn't loose some of the important nutrients! 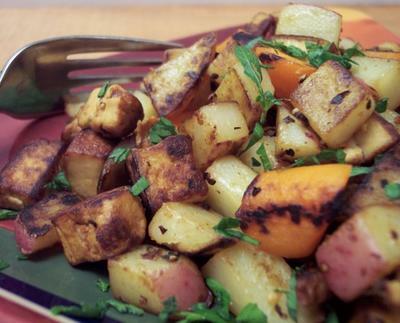 Other than making the Gnocchi - it's a very quick recipe with lots of flavor. I grated some additional parmesan on top and the finished dish was very good! Can't wait to have the leftovers. Check back tomorrow to see what we are cookin up next! But let's talk about dinner first. Tonight we had Gruyère, Arugula, and Prosciutto-Stuffed Chicken Breasts(CL) with Mashed Honey-Roasted Sweet Potatoes(CL). The chicken took a little more time to do than I had set aside, but that's mainly because I was trying to do too many things at once! I butterflied the chicken before pounding and would do that again just to keep them even for stuffing. It's an extra step, but it worked well for me as there is quite a bit to stuff in them. After a quick browning on the stove, I finished them in the oven while mashing the potatoes. Instead of boiling them, we roasted them in cubes per the recipe, and then mixed in butter with some honey. They are light, fluffy, and not overly sweet. Honey gave them a nice subtle flavor without overpowering them at all. A light drizzle of honey on top finished them off. On to the chocolate... As tomorrow is Wednesday, I had a request for brownies for Jeff to bring to his office mates. I prefer fudgy brownies, but the request was for cakey style. I tested out two recipes (thanks for pointing them out Anna and Val!). The first was from the KA Cookie Companion and the other was from Fine Cooking. I used Dutch Cocoa in one and melted unsweetend chocolate in the other.I followed both recipes exactly as stated with one exception, adding in chocolate chips in both. The KA was made in a 9x13 while the Fine Cooking one was baked in a 8X8. I didn't want to halve the first mixture. The KA Version was much taller, but the center took a little longer than I wanted to come out with no wetness on the tester. 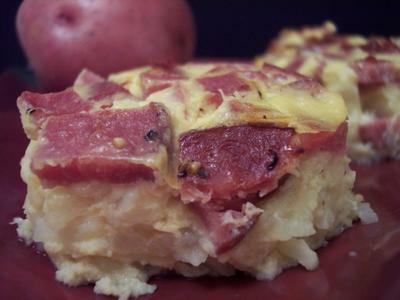 It also has a darker apperance with a more rich and deeper flavor than the Fine Cooking version. Both are unfrosted so we could compare the actual brownie. In the picture the FC brownie is on the left - KA on the right. They are very good for cakey brownies - I think I prefer the cocoa version though. Whew - it sure was a hot one today. The high showed 113 in the shade this afternoon. I tried to get the doggies to go outside but they had other plans... like staying inside the nice cool house! Growing up, for as long as I can remember, I never ate pasta of *any* kind. I had some aversion to its texture and the last time I tried it I was around 10 and that was it for me. One bite and never again I told myself! A couple years ago, attempting to actually try and explore other food realms I decided it was about time I got over it and made a simple spaghetti with sauce. The first bite was pretty odd, but the more I ate it the more I thought to myself "why did I wait this long to try this?" Tonight's dinner was Turkey-Spinach Lasagna(CL). I used homemade sauce instead of jarred but that was the only change I made. I started a little earlier than I normally would since it has a bit of prep time involved, but it was pretty simple. It's very flavorful and pretty light for a meat sauce with the turkey. Quite good! 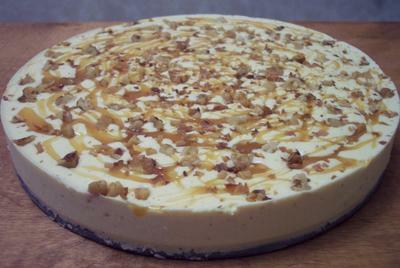 Till tomorrow - the plan is for 2 new dishes for dinner and I will be baking 2 new bar-type recipes! Woke up and got started on the grocery list for this week. The list seemed much longer than normal, but I think we just must be out of getting low on a few items. This next week has a good variety of things I plan on making. I have 5 new dinners planned out if everything goes well. 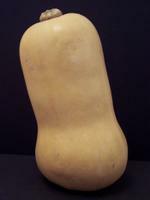 Look to see what we do with this butternut squash on Thursday! At safeway this morning, I surprised myself and the cashier when the register showed this. Apparently we stumbled on a deal and they ended up paying us $1.53 to shop there today! First time that has ever happened to us! Some products ended up being free after using a coupon and they were running a deal that if you bought a certain number the store gave you money off as well. I could handle that happening more often! DVD from Netflix tonight is the animated film Shark Tale. Daily updates to continue so keep checking to see how this week turns out and find out what new items we make! Wishing anyone in the path of Katrina to please try and stay safe! Going over my notes this morning we made 12 new recipes and one that was a common repeat for us. I think that is the most we have ever done in one week! Lots of variety and it was pretty fun! 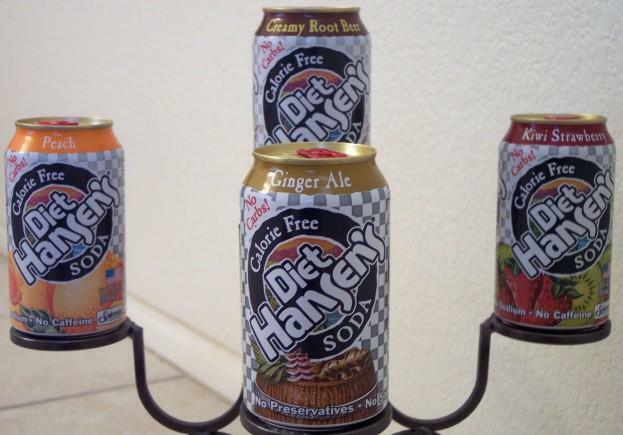 We have been new product testers for a few years now. 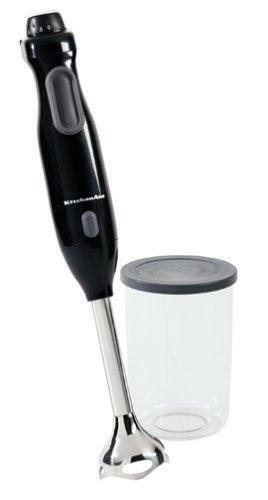 We have tested new food/drink products, pet products, and a couple household tool items. This weekend we are testing something new from Ben and Jerry's! What you see below is all we have to go by when we try them. Looks inviting huh! Nothing really telling us what they are until we taste it - which can be good and bad! So far this test has been pretty interesting. I can't say exactly what the product is yet, but should be able to give more information out soon! Netflix came through again by getting the DVDs to us in time for the weekend. Love their turn around! We will be watching Collateral. We were going to see this in the theater, but passed after reading some of the reviews. It sounds like it's a better rental than paying $10 for a ticket. A lot of movies these days seem like that. Stay tuned as I'm going through the recipe piles and cookbooks to see what the menu for this week will be! 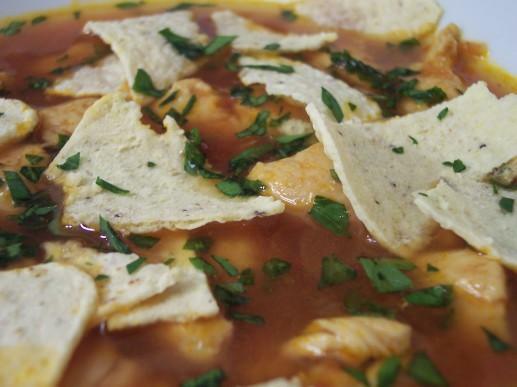 Chipotle Chicken and Tortilla soup(CL) filled our bowls tonight for dinner. It's a very fast dish as the simmer time is only 5 minutes after you brown the diced chicken. Instead of throwing all the tortilla chips in, I kept some aside and added them as we ate for additional crunchy texture. They also helped to thicken it up some. 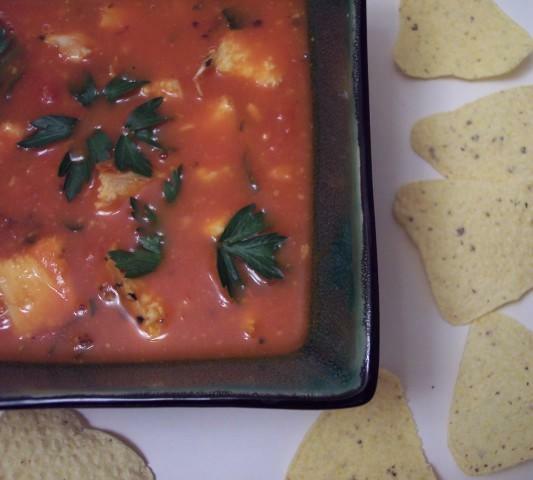 This is a pretty spicy soup as the heat comes from chipotle chile powder. The Small Batch Baking cookbook was calling to me today, so I opened it up and I happened to have all the ingredients that the recipe shown called for. Orange Tea Cakes with Honey Orange Glaze(SBB) was fun to make. They are tender, melt in your mouth, one bite (okay maybe two) cakes that have a sweet sticky glaze. They are baked in a mini muffin pan and when they come out of the oven you poke tiny holes in the top so the glaze you pour on can seep inside and run down the sides. This makes them very moist. I added a little orange zest to up the flavor some and would do so again. The recipe makes 8 so it's just the right amount for us. The recipe for dinner tonight I have had at the top of my to-try pile for awhile, but kept passing it by as I couldn't find an ingredient that I thought would be necessary. 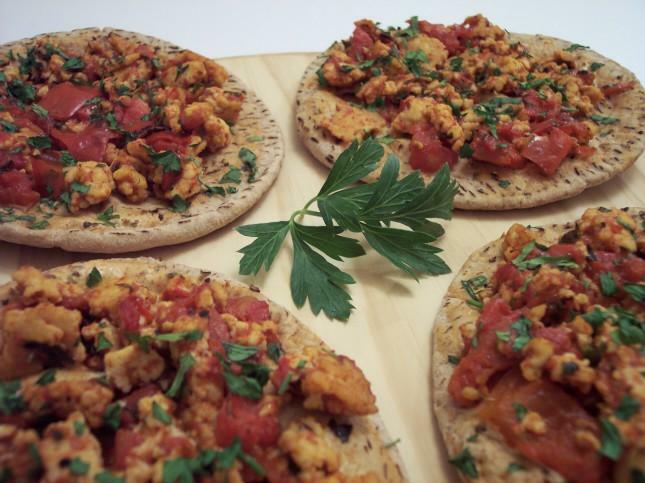 Turkish Turkey Pizza has a spicy yogurt base instead of a pizza sauce and is topped with a mix of fire roasted diced tomatoes and sauteed ground turkey breast. Cumin and allspice flavor the meat and tomato mixture with another interesting ingredient called Pomegranate Molasses. The recipe only called for 1 1/2 tsp but I used a heaping tablespoon as I wanted a bit more of the flavor to come through. I'm glad I made the change! 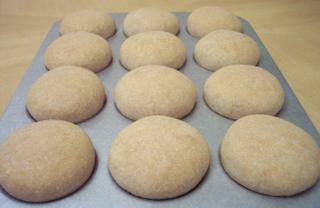 The mixture is then divided between 4 whole wheat pitas and toasted in a very hot oven. 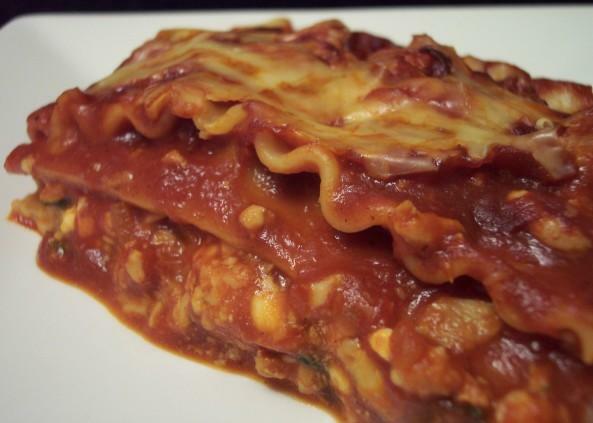 We really enjoyed this and would make it again! Cookies... so many different types that can be made. These are Vanilla Oat Cookies(BBCL). 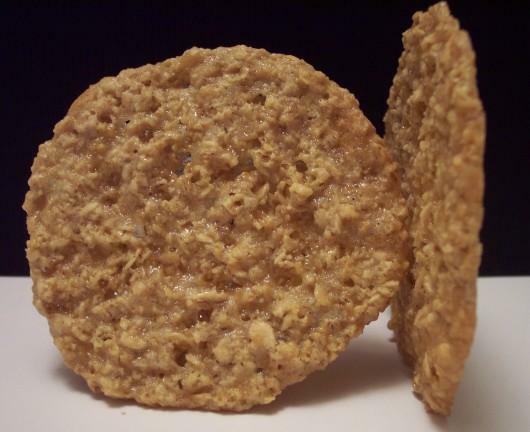 They are a lace type cookie being very thin and having a crisp outer edge while the center is still chewy. I used vanilla paste instead of vanilla extract as I find the flavor packs a bit more of a punch. With a short time to firm up the dough in the refrigerator the cookies come together pretty fast and are nice light snack. The muffins from yesterday must have turned out pretty good as not a single one came home. They kept well overnight and stayed very moist! I was a little nervous making dinner for tonight as it was another "odd" type dish and heard a couple times "what is that and why is it going in?". Below is Middle Eastern burgers from E-W. I believe they are normally served on small pita bread but I wanted to use the homemade buns I had in the freezer. This mixture of ground beef, bulgur, garlic, prunes(! ), and spices held their shape very well. When the meat hit the grill the intense aroma from the cumin along with the other herbs filled the kitchen. 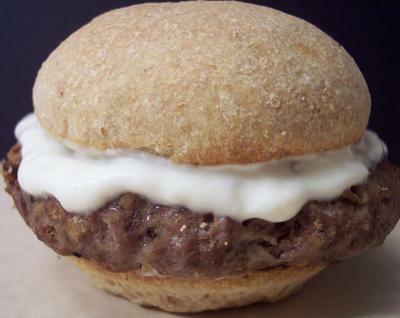 On top of the burgers is a smooth drained yogurt-garlic sauce. Letting the whey drip out from the yogurt for about an hour really thickened up the finished sauce. It's a very cool tasting compliment to the warm burger. I served seasoned and toasted pita chips on the side. Set oven to 375 degrees. Lightly spray a 12 cup muffin pan with cooking spray. 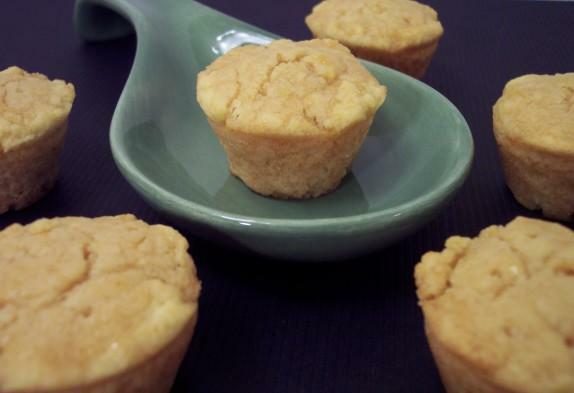 In a large bowl, combine all dry muffin ingredients (except for the sugar). In another bowl, combine the bananas, sugar, egg and melted butter; mix well, stir into the dry ingredients, only until moistened. Fill the muffin cups 3/4 cup full. Crumb Topping: Combine brown sugar, flour, cinnamon; cut into butter until crumbly, add in the nuts. Sprinkle over muffins. Bake 18-20 minutes, or until muffins test done. Cool in pan 10 minutes before removing to a wire rack. Mine took exactly 18 mins. I couldn’t decide what I wanted to make for Jeff to bring into the office tomorrow for the weekly hump day treats. 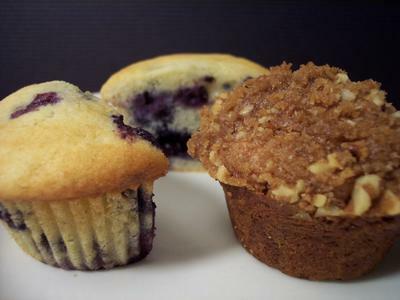 I needed to use up some bananas and had some extra blueberries in the fridge so we went with Banana Walnut-Crumb Topped Muffins and Blueberry Coffee Cake Muffins(BC). We had a total of 30 muffins so I hope they are hungry! The Coffee Cake muffins took a little extra effort as the batter was pretty thick and had to divide them between 18 tins. I think they came out well, but I guess we’ll hear tomorrow! Dinner tonight was interesting.Bowties with Broccoli Pesto(Culinary Cafe) was on tap. 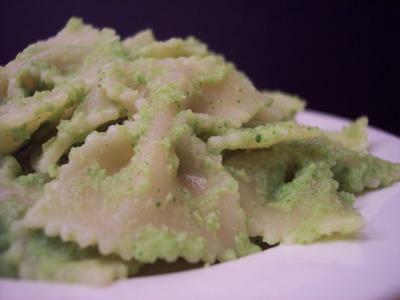 I have enjoyed playing with pesto but this was somewhat different as you blended in 1 lb(!) of crisp-tender broccoli into the mix of parmesan, garlic and olive oil. An added bit of flavor came from a little toasted sesame oil. I really didn't know if this was going to work as I was putting it together, as it seemed like a LOT of pesto for 4 servings. The intense broccoli flavor goes perfect with the al dente bowties. This mix suprised me as I thought it might be a tad overpowering but I think it came out much better than I expected. I did thin out the pesto with a little pasta water. Would make again and also think it might be good to bring for a picnic. 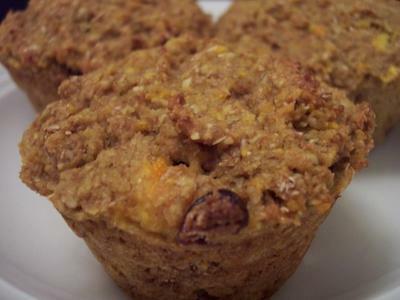 In a large bowl, combine oat bran, flour, flaxseed, wheat bran, baking powder and salt. Set aside. Have you had a healthy snack today? We sure did! I was looking for a different muffin to bake up for snacks other than our normal one. What initially caught my eye in this recipe was that it called for 1 whole orange that you put in the blender with the rest of the wet ingredients. I thought that was kind of unusual as I've never done something like that (minus the seeds if you couldn't find a seedless one). Orange Bran Flaxseed Muffins are packed full of healthy grains, fruit and a bit of brown sugar for the right amount of sweetness. The smell these gave off while baking was amazing! The texture is as expected from the use of oat/wheat bran and ground flaxseed, but it doesn't have a rubbery texture and I don't find they are that heavy either. Keeping in line with the healthy trek we started on today, tonight's dinner was Maple-Balsamic Pork Tenderloins(CL). 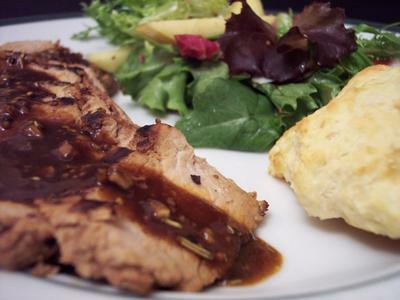 A side of Green Salad with Apples and Maple-Walnut Dressing(CL) went very well with the light and very tender meat. I needed to buy a bottle of Walnut oil for this - Glad I did, but I wish it came in a smaller container! I had a request for the sour cream cheddar drop biscuits, so I mixed that up right before the meat was done so that rounded out the meal. Sat down and finalized a list of what to make this upcoming week. I think there will be quite a few new baked goods along with dinners. Flour, sugar, oats, and brown sugar will make quite a few apperances in one form or another! Much time was spent grocery shopping this morning - thankfully we can go early enough and not have to deal so much with the busy crowds. For a long time we had a rotation of the same type of stuff for dinner and one day I was just getting tired looking at the stack of new recipes but never getting around to trying them. A couple months ago I decided I really wanted to work through the pile and expand on our eating style. As time goes by, I think it's becoming a stronger addiction as I just want to keep going now that we've started! It has been fun tasting and creating things I never thought we would like. Hopefully I will not get the burn out I did before but as the commerical says "I'm lovin' it!" Comedy night from Netflix. The DVD that will be watched is Miss Congeniality 2. The first one was mildly funny so let's see how bad the sequel is! I think we have almost the same number (if not more) of new recipes ahead so keep checking back and see how it goes! What a week! We had a total of 10 new to us recipes. I think they all came out pretty well! It sure was a lot of stuff but it was fun making new things we haven't done before. I love weekends but I just wish time would slow down a bit so we could enjoy them more. Took a nice walk this morning with the dogs before it was ungodly hot. We had to run out to home depot and get a repair kit to fix one of water hoses for the landscaping sprinklers - other than that its time to relax! Since we had a couple tortillas left over I thought I would change up our saturday chicken salads a bit. I shaped and baked the tortillas (crispy and crunchy without all the deep fried guilt!) 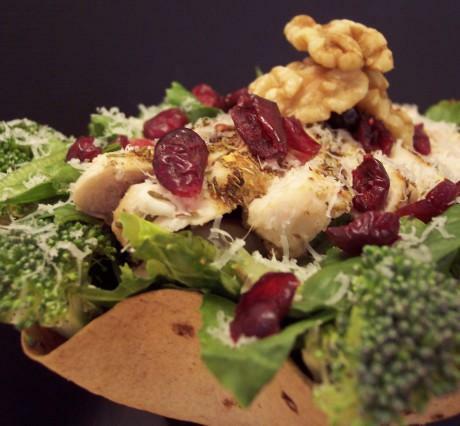 and then filled with romaine, broccoli, grilled herb-coated chicken breast, craisins, walnuts and topped with grated asiago cheese. This was a great variation to dinner! Next on the list from Netflix for tonight is National Treasure. I don't even remember seeing any previews for this so hopefully it is good! Will be spending some time tonight going through the recipe stack and see what we come up with for this upcoming week. I hope to make a few new recipes but we will see. Keep watch and see what we come up with! Never too early to start I say! 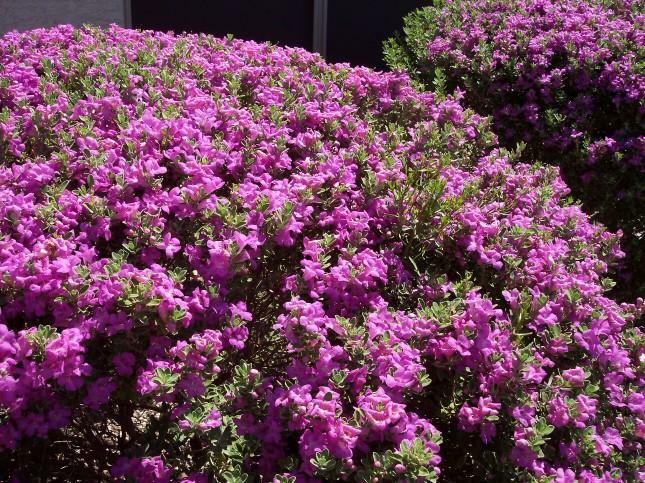 We are already more than half way through august - the holidays are coming up fast! Perfect time to start testing cookies and baked goods we will be giving out. Well, that's my excuse anyway! These huge cookies are Mocha Chocolate Crinkles - Adapated from KA Cookie Companion. They are ever so slightly fudgy in the middle and have a nice crisp edge. Almost like a brownie inside a cookie. The cookies are almost 4" across while still being fairly thick. This definitely makes the list this year! I like to make dishes that can give us some leftovers for lunch during the week so dinner tonight fits in perfect for that! Farmer's casserole is something I don't believe we've made before but it is very much like some other dishes we have done in the past. There are many different variations out there but for us tonight I included aged white cheddar cheese, shredded potatoes and some leftover ham that I browned before hand. A very hearty and filling meal that makes plenty for at least a couple lunches next week. The fish taco recipe is posted below. Spicy fish tacos with Chipotle sauce. Mix all ingredients together in a small bowl and let stand at least 10 mins. Keep chilled until ready to serve. Continue on to make the fish. Marinate fish in lime juice for 10 mins, turning to coat. Place baking sheet wrapped in foil on oven rack and heat for 5 minutes. Blend flour, cornmeal and next 3 ingredients in a shallow dish. Coat fish on both sides and set aside. Remove sheet from oven and spray with non-stick cooking spray. Place coated fish on the pan and roast for 5 mins or until done to your liking. When the fish is ready assemble to your liking and enjoy! We warmed the tortillas then spread on the sauce. We placed the lettuce then the fish and rolled up. I made a trip to Whole Foods today to get some fresh cod for dinner tonight. Luckly I made it out with only the fish after wandering the aisles. Spicy Fish Tacos with Chipotle Lime Sauce is what we had this evening (Adapted from Cuisine @ Home). The fish, after being marinated in fresh lime juice, is coated with a crunchy mix of cornmeal, flour, adobo chili powder and cayenne. The creamy and spicy sauce has chipotle peppers in adobo sauce which really brings out the heat. I choose to use flavored soft tortillas and rolled them up to make a wrap. These would be very good either way with soft or hard tortillas. 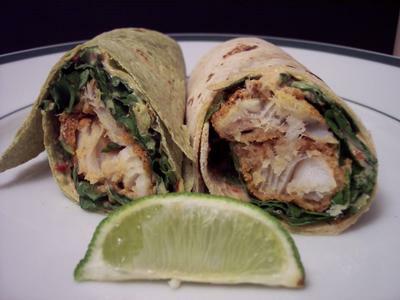 The wraps are very filling and hot hot hot! So the other day, I mentioned we got a great deal on boneless/skinless chicken breast. I chose today to trim them up a little and put them in servings to freeze. I looked at the first package thinking it was bursting a bit so I took a peak in the refrigerator drawer they were kept in and noticed the icky chicken puddle. Ugh I hate when meat leaks - we even put them in the handy bags they keep beside them. So I get all that cleaned up and start in on the chicken... Can I just say our freezer has enough to feed a small army now? Figures, we don't even have chicken on the menu this week. Next time I see a deal I will force myself to just a couple packages rather than deal with all this mess. Dinner tonight was a casserole dish that we thought would be an interesting combination of flavors. 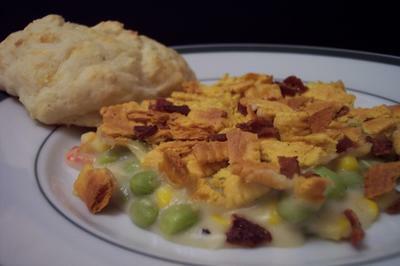 Succotash-Cheddar Casserole with Crunchy Bacon Topping(CL) peaked my interest when I saw it as I wanted to play around with the ingredients. I used Edamame instead of lima beans, fontina cheese, and fresh grilled corn. For the topping I used Kashi Cheddar TLC crackers along with center-cut bacon. The top was very crunchy and the soft-set creamy filling made for a great texture combination. I served this with the Sour Cream Cheddar biscuits that I froze a couple weeks ago. They reheat and toast up just like they were fresh from the oven. I went back for a follow up with the shoulder doc and was given the go ahead to start exercising again, but to just take it slow. I was suprised as he said I do not need to go to the physical therapist again. Apparently my shoulder is healing well and with no stiffness there is no need. I think I will just start off with doing some of the smaller exercises I was doing when I went to PT and take it from there. We will start off with what we had for dinner tonight. 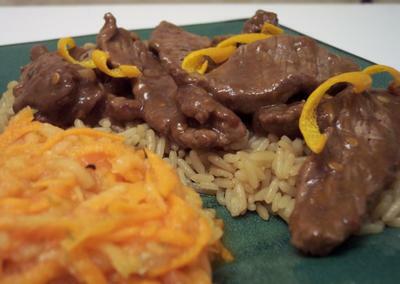 The two new recipes were Spicy orange beef over rice (CL) and Papaya-Carrot Slaw (CL). Breaking open the papaya was fun! Thanks again for the warning of the seeds - I did this over the sink! 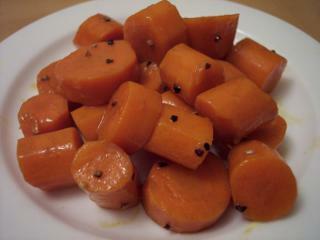 I used the food processor to shred the carrots and papaya making life much easier. It's a very simple and light side with the lime and fresh ginger. The spicy orange beef being stir fried was so juicy and the bright orange flavor really shined through. These are both definte repeaters here! Being tuesday I made the "treats for work" for Jeff to bring in tomorrow. This was adapated from a recipe by Nick Malgieri. 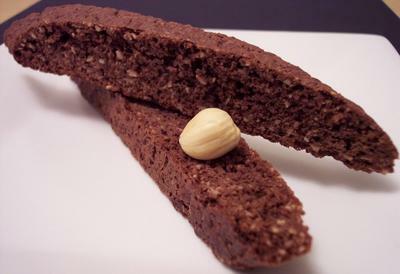 Below is Milk Chocolate Hazelnut Biscotti. I was only able to buy hazelnuts with the skin on so it took a little toasting and with a soft cloth I removed most of skin. It was a little tedious but worth it! 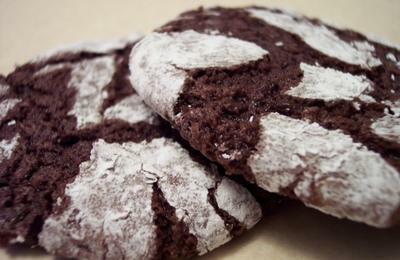 This blend of cocoa, milk chocolate, and hazelnuts is such a great combination of flavors in a biscotti. The logs were very easy to handle - not too sticky. I just had to have a sample before they were taken in tomorrow and they are a winner! Combine first 5 ingredients in a medium bowl, stirring with a whisk. Place milk in a shallow bowl. Dip zucchini slices in milk, and dredge in breadcrumb mixture. Place coated slices on an ovenproof wire rack coated with cooking spray; place rack on a baking sheet. (I did these on a baking stone instead). Bake at 425° for 30 minutes or until browned and crisp. Serve immediately. Starting the week with a bang.. So if this week goes as well as today then all these new recipes should be no problem! Everything came together great today and we came out with trying three new dishes! For the main dish we have Curried Chicken Salad with Apples and Craisins (CL). The orignial recipe called for raisins but we usually do not have them around. I served this on toasted honey whole grain bread. The blend of curry powder, fruit, and chicken was tangy and smokey; when combined with the slightly sweet crunchy bread was a fresh change of pace! 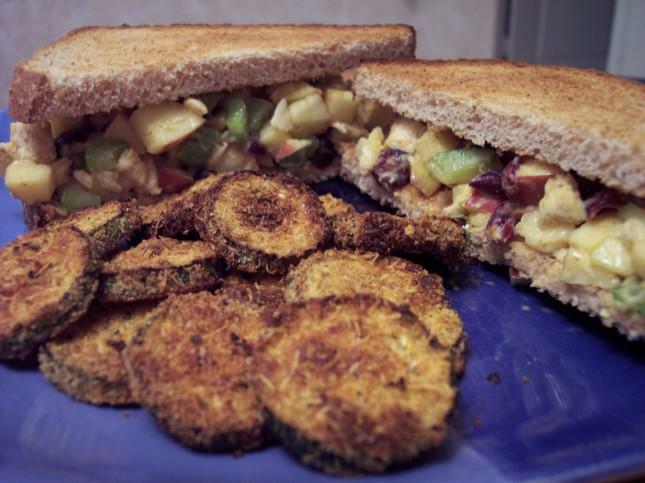 On the side was Zucchini Oven Chips (CL). 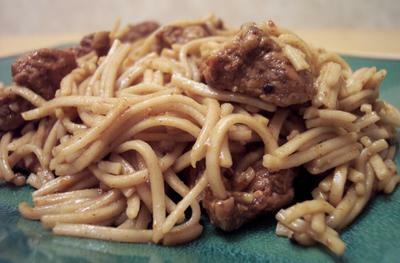 I changed a couple ingredients around using Asiago and adding some cayenne pepper. We both really enjoyed these! The recipe didn't make enough in my opinion - so good! I think I had enough breading for another zucchini so I will have to remember that next time. For dessert tonight I made Turtle Ice Cream pie. This has a bottom of rich chocolate brownies layered with silky homemade vanilla bean ice cream, caramel topping and nuts. How can this combo possibly go wrong? This was so smooth and really finished off our dinner with a bang! Woke up early this morning and tried to get the massive grocery list finished. This upcoming week we have a lot of new recipes for us to play around with. As of now I think the total number is around 7 or 8 including main dishes, side dishes, and desserts. Whew! This should be a fun week! We pretty much drink only water around the house but we have heard some good reviews of Hansen's soda. One of the local stores had a good sale so we picked up a few different kinds so we could try them out and see if they live up to the hype. They are in the fridge coolin' down as I write this! 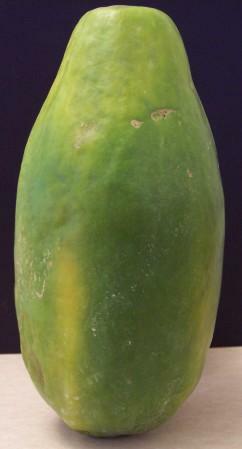 We also picked up a Papaya which is a fruit we have never used before. I don't think we have ever tasted it. It will be used in a slaw-type side dish later in the week. Can't wait to see how that comes out! Finally the monsoon season has started to settle down some and we get to reap the benefits of all the rain! The tree's start turning from yellow (sunburns!) to green and the flowers come back out! 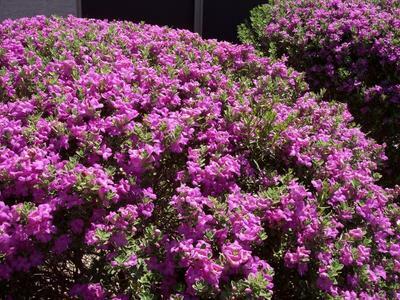 This is one of the bushes in front of our house - it gets so full with these little purple flowers! Thanks to netflix the DVD for this evening is Mean Girls. Hitch last night was pretty good. A little too long but was still funny! Stay tuned this week and see if we manage to pull all these new recipes off. Spent some of the morning at a new store that opened up close to us. Henry's Marketplace which is apparently owned by Wild Oats is kind of like a cross between a healthfood store and an indoor farmers market. Lots of fresh produce, great meat selection and quite a few different bulk products. I admit it was the $1.47/lb boneless/skinless chicken breast that sucked us in as it is such a great price because they don't inject the chicken with that "solution" we see in the grocery stores. 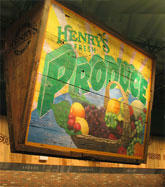 We also picked up some bananas and grapes at pretty good prices. 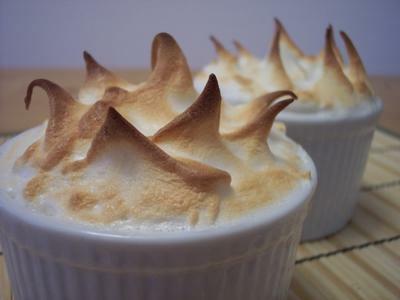 After we got back and had lunch I made a couple individual lemon meringue pie type desserts for later tonight. A basic cookie crust (I used Trader Joe's cinnamon cat cookies for something different), homemade lemon curd and a simple meringue top. Tonight's netflix selection will be Hitch. I will also start to go through the massive "to try" list of recipes I have set aside and figure out this week's menu. Keep watch and see what next new thing we try! Oh no... we liked it! Okay so the title gave it away. We delved into tofu land... and it was good! Tonight's dinner was Hash Browns with Italian Seasoned Tofu(CL). When I took the tofu out of the package I got "the look" of what are you making me eat tonight? It was firm, but kind of squishy, which got me a little worried that the texture would be off. I used red skin potatoes instead of the pre-packaged kind called for and soaked them in cold salted water for 10 minutes. The potatoes and carrots cooked in no time and adding the tofu in last it still had enough time to get a nice color. After cooking the tofu seemed to firm up more and have a meaty texture which is a good thing! So... what can we make next with tofu - this was fun! I never thought it would be something we would like.. but that goes to show you never know until you try it! I decided to spend a lot of my time to finally reorganizing our cabinets in the kitchen as they were a mess to try to find anything. I pulled everything out and now I know where everything is when I need it. If we could only figure out how to paint the kitchen we would be set! It's just so open and connects with many "main" walls that go throughout the house it's hard to decide. 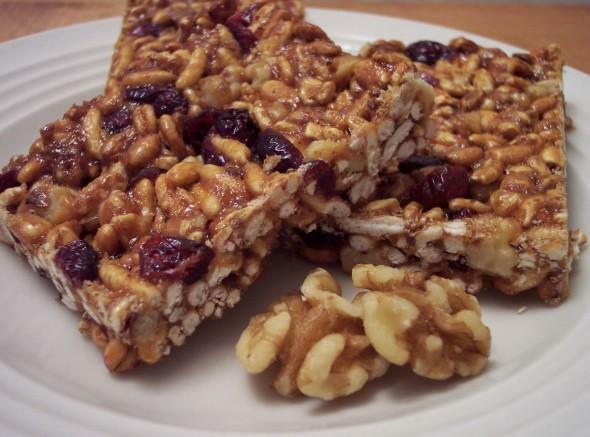 Anna mentioned that she made a version of Bon Appétit Sports bars with Dried fruit and Peanut Butter. I decided to play around with the recipe and see how it would come out. 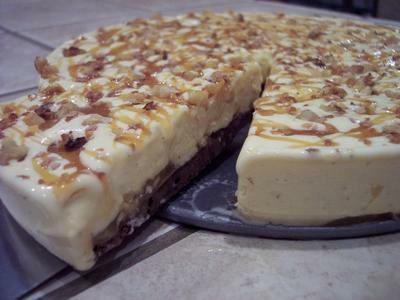 I replaced the corn syrup, honey, dates and raisins then replaced with other items. These held together so well and cut very clean. They are crunchy on the outside but the inside remains chewy. The subtle peanut butter taste pairs well with the whole grain cereal and dried fruits. I also toasted the walnuts before they went in to help bring out more of a nut flavor. Here is the recipe with my changes. I typically use a scale when I bake for consistancy. Preheat oven to 350°F. Line a 9-inch square baking pan with foil and lighty coat with cooking spray. Mix cereal, walnuts, cranberries, and apples in medium bowl. Combine peanut butter, brown rice syrup, and lyle's golden syrup in heavy small saucepan. Bring to boil, whisking constantly until mixture bubbles vigorously, about 1 minute. Pour peanut butter mixture over cereal mixture in bowl; stir quickly to blend. Pour mixture into prepared pan and press to compact. Bake until just golden around edges, about 10 minutes. Cool completely. Dinner tonight was leftovers of the Turkey Jasmine meatballs with Bok Choy and Maple Balsamic carrots. Tomorrow night's dinner will be our first time cooking with Tofu - Stay tuned and see how it comes out! Well - for dinner that is. Before we go on to that since today is Wednesday it is the day Jeff brings in something to share at work. I made this yesterday but it had to set up overnight and I didn't cut or get pictures until this morning. 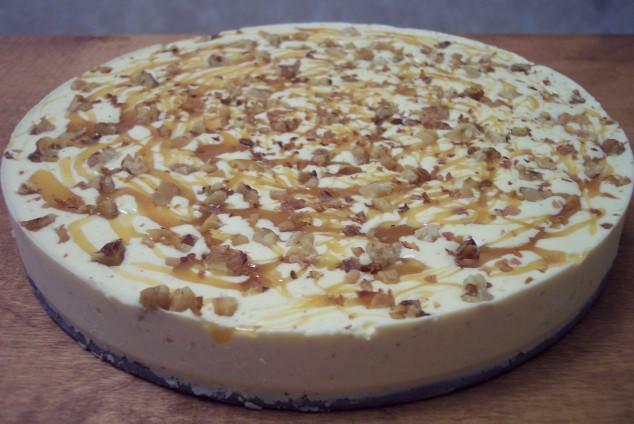 The recipe is adapted from an older Martha recipe. 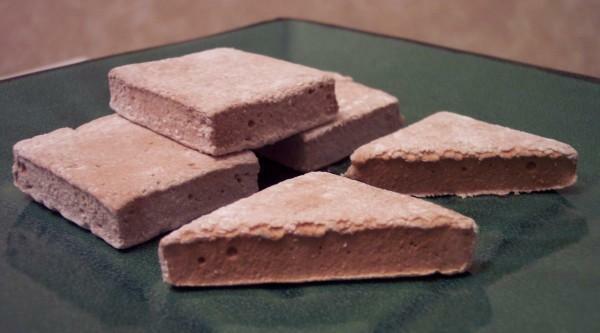 Below are Cocoa Marshmallows. 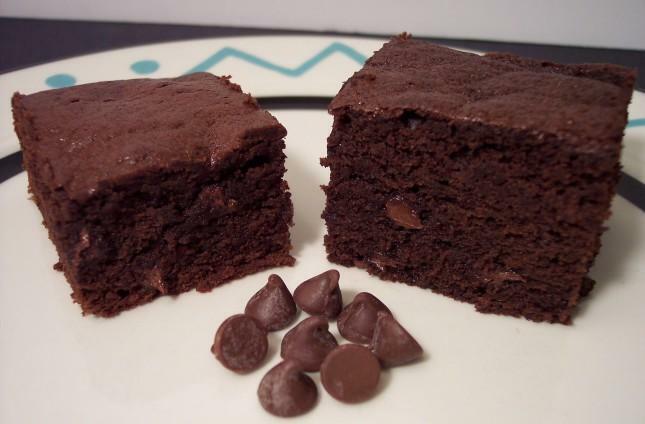 The squares are soft, airy, and the hint of chocolate really makes these wonderful. I used a 9x13 springform to get thinner marshmallows and for ease of getting them out of the pan. 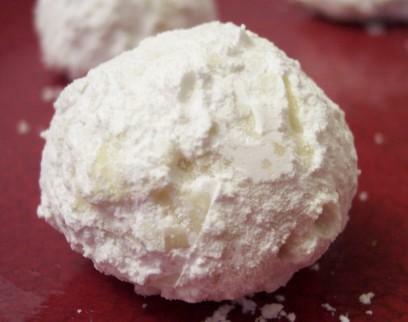 They look fairly light because the dusting of powdered sugar so they don't stick to everything in sight! On we go to tonight's dinner. This was Turkey Vatapa(CL). This used a new ingredient for us which was the Coconut Milk. The recipe calls for 12 oz of beer, but we do not drink that often so a friend (Thanks Leslie!) gave us a can of beer to use. It also includes ground peanuts which brings out a nutty undertone. A great way to use leftover chicken or turkey. The coconut milk gives this a slightly rich and creamy texture that goes very well with the chunky tomatoes and peanuts. Since we usually like it hot (we do live in Phoenix after all) I left half the rib and some seeds from a jalapeno to give a spicy flavor. A splash of fresh lime juice and parsley finished off this stew. I tried a bun recipe about a year ago and have been using it ever since for our hamburger buns. We only had one left in the freezer so I made these today to restock. The recipe fits well with our KAF bun pan and using half whole wheat flour it makes for an excellent roll when we have burgers. It has great depth of flavor and freezes very well. I usually make this recipe once or twice a month depending on how fast we go through them. Using one of the new ingredients purchased this weekend dinner tonight was pretty fun to put together. 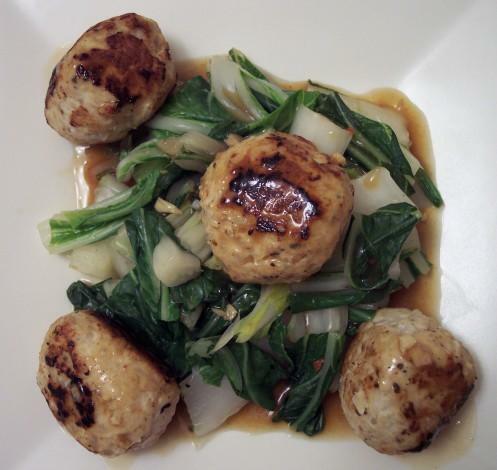 Turkey-Jasmine rice Meatballs with Bok Choy was the main part of our dinner this evening. I anticipated that the meatballs were going to take some prep time so I mixed and formed them a few hours before dinner. They held together very well and were not at all dried out as I feared they might be. The rice was an interesting but fun texture! It was finished off with a sauce made from the liquid used for steaming the bok choy. The bok choy was slightly sweet and went over well enough that we would use it again. We had a ton of carrots in the refrigerator that I needed to use so as a side I made Carrot Coins with Maple-Balsamic browned butter. This was excellent! Crisp tender carrots with the sweet buttery glaze was quick to throw together and a definite repeater! So here starts the week of many new recipes and ingredients! 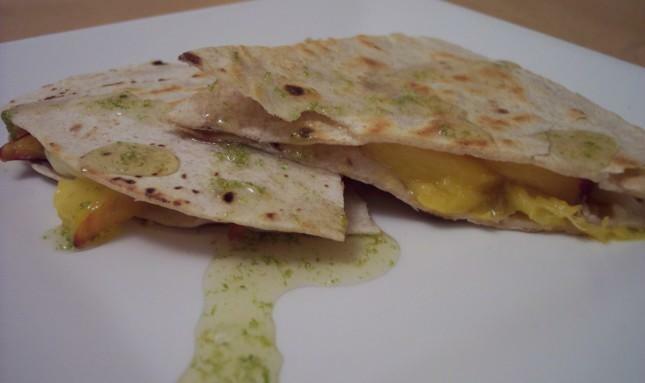 We started dinner tonight with Peach and Brie Quesadillas with a Lime-Honey drizzle. I used honey whole wheat tortillas and very fresh peaches. This was sooo good. The buttery brie with the sweet honey and peaches made my face light up on first bite. This will definetly be repeated. Perfect to serve for guests. 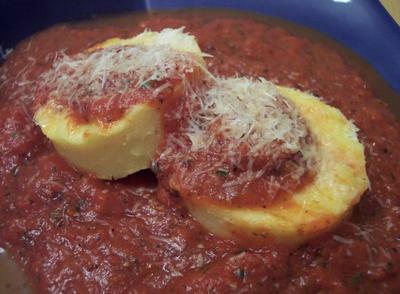 Polenta cakes with a Fire roasted tomato sauce topped with grated parmesan was our entree. We used instant polenta (Thanks again Mari K and Debra) for the first time and after refrigerating it looked/felt just like the stuff you find premade! But tastes much better! We grilled the polenta after cutting it out and the crispy outside, but creamy warm inside was tasty! The fire roasted tomatoes were enhanced by fresh oregano and basil. The added parmesan was subtle but the pungent nature of the cheese still came through. The requested recipes will be posted below. Enjoy! 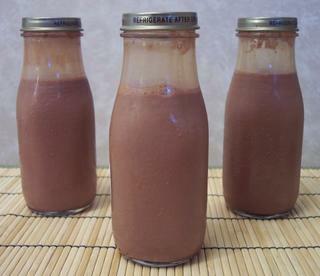 Manual/Mixer Method: In a medium-sized mixing bowl, or the bowl of your electric mixer, combine all of the ingredients. Stir the mixture together, using your hands, a spoon, or your mixer, till the dough forms a shaggy mass that begins to pull away from the sides of the bowl. Knead the dough, by hand or mixer, for about 10 minutes, till it's become smooth. Transfer it to a lightly oiled bowl, turning to coat all sides. Cover the bowl, and allow the dough to rise until doubled in bulk, at least 1 hour. Bread Machine Method: Place all of the ingredients into the pan of your bread machine. Program the machine for manual or dough, and press Start. Examine the dough about midway through the kneading cycle; it should be soft and smooth, but not overly sticky. 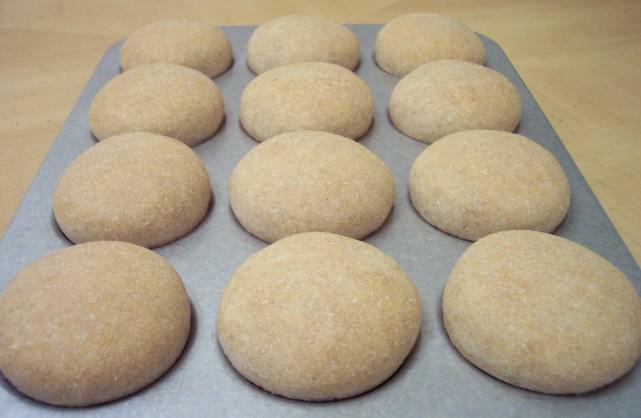 Adjust the consistency with additional water or bread flour, as needed. Allow the machine to complete its cycle. Shape the dough into a loaf, and place it in a greased 8 1/2 x 4 1/2-inch loaf pan. Tent the dough with a proof cover or lightly greased plastic wrap, and allow it to rise for about 1 hour, or until it’s crowned 1 to 2 inches over the rim of the pan. Bake the bread in a preheated 350°F oven for 35 to 45 minutes. The loaf will appear slightly darker on the top when it's done. Remove from the oven, and cool on a wire rack. Grocery day today - we spent a good amount of the morning looking for the stuff we needed for this week. We have quite a few new dishes we will be making and we tracked all over finding everything. Shown below is a picture of the new goodies (term used very loosely as we will see if they are any good!) 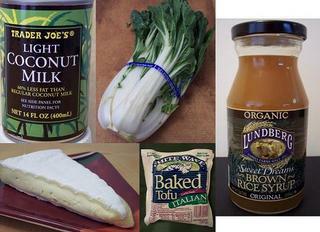 Light coconut milk, Bok Choy, Baked Tofu (oh my), Brie Cheese, and Brown rice syrup. Keep watch to see how we use these different ingredients this week - I hope the outcome of these dishes will be worth it! Last night's movie was pretty good for being somewhat unknown! It had it's bad parts but overall I'm glad it was put in the queue. Tonight's selection from netflix will be The Last Samurai. This was put on the list before Mr. Cruise decided to open his mouth way too often about how he thinks people should live life. Oh well, let's hope we do not fall asleep or anything. I'm pretty excitied about the menu for this week. It is stuffed with quite a few items that will expand how and what we might cook in the future! So it's the weekend... time to get some items crossed off the must-do list. 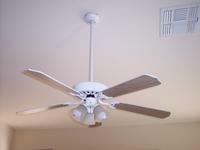 We started off by getting the ceiling fan replaced in the living room. 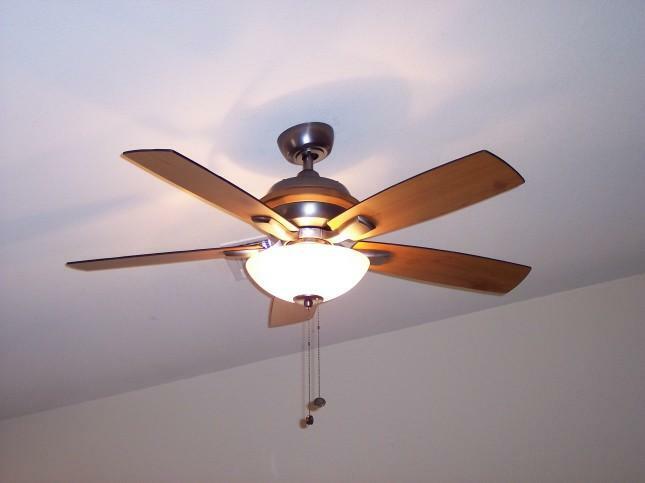 The older one was very loud and just annoying when trying to concentrate. It only took us a few months to finally get the new one out and up, but it looks pretty good! We then did the outside work of trimming hedges, mowing, raking rocks around, and some thinning of the trees outside. I'm ready for a nap! Netflix delivered the comedy DVD Greenfingers. Never heard of this as I didn't put it in the queue. Hopefully it will be entertaining enough! For dinner tonight it will be the Saturday Night Chicken salad's(TM). Will be preparing the menu for next week also - so far it looks very promising! Stay tuned! The door bell rang this morning and then commenced with the barking of the dogs until I went to see who it was. They tend to go crazy whenever they hear that noise. UPS was there and looked like they were about to run away until they saw the dogs were under control and friendly. She handed me the package from amazon and I wondered what I ordered. I totally forgot about it so it was a nice suprise to see this! We had a much older one that the control button was broken and you had to stick your finger inside to get it to work. I've been doing that for around 6 months, but when someone (we wont name who........) while I was out of the kitchen after surgery had to use it I instantly heard I need a new one. "What are you doing using this?" I reminded him that he tried to fix it right after it broke and said its OK to use - no problem. Hmph, funny how that is! After a quick trip to Trader Joe's in the morning to pick up some pork tenderloin, dinner was put together pretty fast tonight. Five-Spice Pork Lo Mein is what we had. This was the first time we tried this spice after a Penzey's visit. We have not had much experience in chinese food but this was great! I really enjoyed how you could pick out the different spice flavors. Hoisin finished off the sauce bringing the noodles and pork together. I opened up the Small batch baking cookbook again today and landed on Lemon Coolers. I havent had that kind of a cookie in a long time! We used to buy them occasionally but I had forgotten about them. I think this was the easiest cookie I have ever made! I love how the tart flavor shines in these buttery, melt in your mouth cookies. I usually make a honey graham cracker bread every couple weeks that we use for toasting. 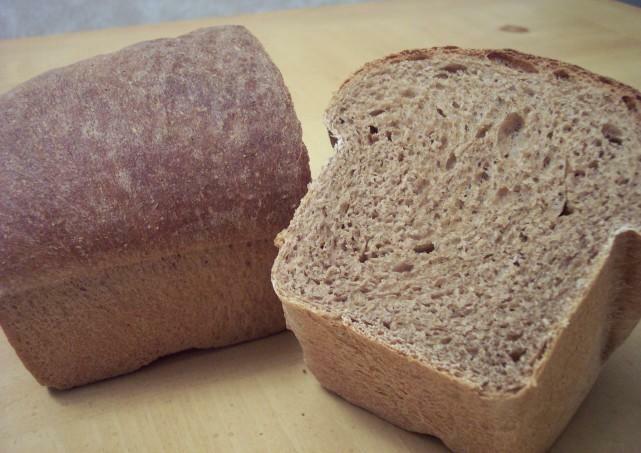 I wanted to veer off track and try something a little different today so I went with Honey Wheat Black Bread. This dark and somewhat sweet bread has a variety of ingredients including cocoa and espresso powder! It rose quite high and the texture is just right for us. Supposedly this is known as Canadian brown bread but I don't know how authentic that is. Trying to clean out the fridge and take a break from cooking tonight so it was leftovers. We had the last of the Corn and Poblano pizza (this reheats so well in a toaster oven) and the sour cream cheddar biscuits. What is in that pizza? !